Golders Green synagogue closed after pepper spray attack. Police sealed off the shul to the public, though incident wasn’t thought to be racially motivated. 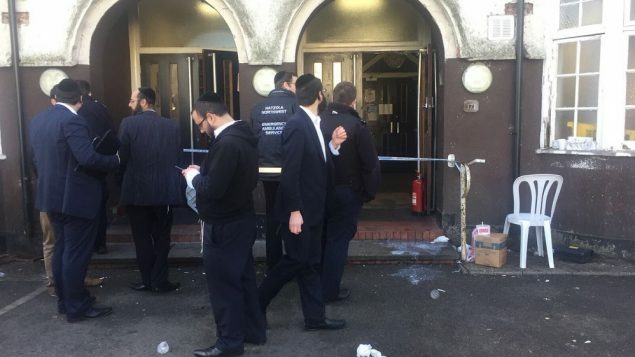 A synagogue on Golders Green road was sealed off to the public on Sunday afternoon after a man carried out a pepper spray attack inside the building. Treating it as a crime scene, police went through CCTV footage together with Shomrim, with London Fire engines also at the scene. The suspect immediately fled the scene, though at this time, the incident isn’t believed to be racially motivated. The synagogue was later reopened for afternoon services, once police and emergency services had left the scene. A spokesperson for the police told Jewish News, they “were alerted at 12.58hrs on Sunday 19 November to reports of an altercation at a synagogue in Golders Green road. London Fire Brigade also attended. When officers arrived, they found a man in his 60s suffering from the effects of being sprayed with an unidentified substance. Tests will be carried out to establish the nature of the substance, but it is believed it to be CS gas.